Current school systems create a generation of students who experience institutional practices that honor other students' needs-those students who share the values of those with power-and have pathologized other groups, specifically women of color. (In) Visible Presence intends to contribute to existing pedagogy, which empowers students, teachers, administrators, and policy makers to develop partic… ipatory membership in schools and among citizens who can begin to create an anti-oppressive society. 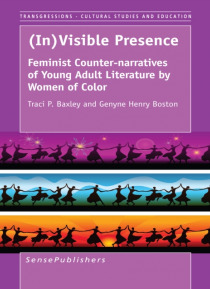 (In) Visible Presence contains a holistic, thematic approach to exploring young adult (YA) novels written by women of color, while providing cultural and historical contexts for interpreting and analyzing their work through a feminist lens. Unlike other scholarship, (In) Visible Presence uses a feminist theoretical framework to create a space in which select literary works offer counter-narratives that can be analyzed and critically interpreted according to principles and ideas intended to validate women, thus making their triumph over racism, sexism, classism, and heterosexism and equity challenges a visible cause relegating consequential change for both young girls and women of color. (In) Visible Presence maintains current discourse dialogue through a concentration on the intersectionality of gender, race, and class identities and how these identifiers serve as criteria for privilege and marginalization, even in YA literature. (In) Visible Presence aims to explore YA literature written by women of color represented by African American, Asian American, Indian American, and Latina Americans. Our theoretical perspective focuses on the connection of race, gender, and class that is exclusive to women of color. The construction of "e;voice"e; and "e;space"e; is important for readers to hear from those once silenced.